HARLEM — They call it a tale of two Harlems. East Harlem politicos with close ties to City Council Speaker Melissa Mark-Viverito are borrowing Mayor Bill de Blasio's "Tale of Two Cities" campaign motif to explain why they have thrown their support behind Sen. Adriano Espaillat instead of Charlie Rangel in the Democratic primary for the 13th congressional district. They say Rangel, seeking a 23rd term, has consistently ignored the section of his congressional district that covers East Harlem, instead favoring his home political base of Central Harlem. They say the proof is clear in the rapid gentrification of Central Harlem's streets, while East Harlem has languished. "I see the difference in the west side in Harlem. You walk through there and you think you are downtown. But you come over here in East Harlem and it's like a photo op of 1972," said John Ruiz, a founder of the Democratic Club of El Barrio/East Harlem and district leader. "We want to progress also. We are supposed to be a whole congressional district, a whole community and I don't see that." East Harlem district leader and Community Board 11 member Peggy Morales agreed. "We need to get someone who is fresh who is new and who will take the chance and focus a little bit more on the East Harlem community, which in my opinion has been ignored by the Harlem machinery...in favor of Central Harlem," said Morales. Rangel's 13th district constituents in the Bronx have also complained about being ignored. The sentiment was echoed — albeit more delicately — by Mark-Viverito on Friday, when she introduced Espaillat to senior citizens at the Leonard Covelo Senior Center on East 109th Street near Second Avenue. 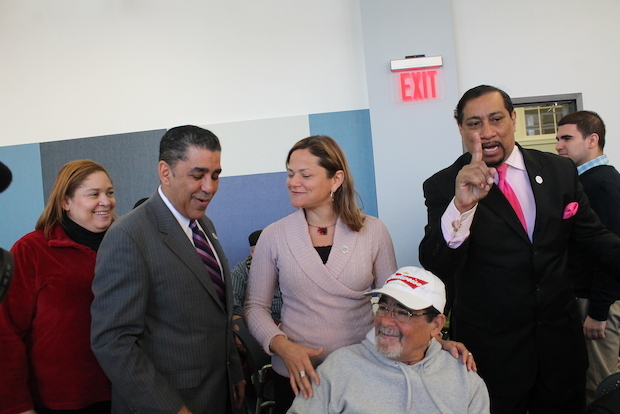 The event came a day after Mark-Viverito announced her support for Espaillat over Rangel for the primary. Mark-Viverito said she wanted "additional support" for "services and programs that work," using the recently refurbished senior center as an example. Espaillat talked about "uniting the district." However, as some Rangel staff pointed out, Mark-Viverito bears some of the responsibility for East Harlem's current state since she's represented the area for eight years and was a Rangel supporter just two years ago. Rangel spokesman James Freedland called criticism of the incumbent congressman "negative" and "divisive." "The record is clear — from East Harlem to Washington Heights to Norwood, noone is fighting harder for all the people of the 13th Congressional District than Charlie Rangel," said Freedland. "Whether it's pushing for living wages, unemployment insurance, working to pass real immigration reform or standing up for veterans, Congressman Rangel has delivered." Rangel beat Espaillat by just over 1,000 votes in 2012 and is also facing a challenge for African American voters in Central Harlem from the Rev. Michael Walrond, an associate of the Rev. Al Sharpton. Mark-Viverito's shifting alliances are a sign of strengthening coalitions between Latino ethnic groups as they attempt to consolidate power, said Angelo Falcón, president of the National Institute for Latino Policy. "She's like a free agent who's putting her fortunes on working with the Dominican community. It's a gamble but she sees that right now she has an upper hand and is in the political spotlight," said Falcón. The critique of Espaillat in East Harlem during the last election was that he was a little too focused on ethnicity. This time around, Espaillat is going out of his way to downplay the racial and ethnic divisions inherent in the race, observers say. “Ethnic pride has its place, but this is a district that has common issues across ethnic, religious, and gender lines,” Espaillat said when he announced his election bid last week on what happened to be Dominican Independence Day. “When your rent goes up, it doesn’t matter whether you’re Latino or black or White." “We cannot fight them alone. We need one voice in Washington. That’s what’s lacking in this district, and that’s why I’m running for congress," Espaillat said. The discussion about an unequal distribution of resources between Central Harlem and East Harlem is not new. East Harlem politicians have long complained about the money that flows into Central Harlem through groups such as the Upper Manhattan Empowerment Zone which was created by Rangel-sponsored legislation. Ruiz even complained about Rangel not having a constituent services office in East Harlem. Rangel's lone district office is located on 125th Street and Adam Clayton Powell Jr. Boulevard in Central Harlem. "East Harlem has felt for quite some time that they are not getting their fair share respect from officials on other side of Park Avenue," said political consultant Basil Smikle. Smikle said that this shift in East Harlem to unite Puerto Ricans and Dominicans could have larger implications if the coalition begins to ask why New York City has never had a Latino mayor, for example. "It's a proxy for a larger discussion about city-wide politics," said Smikle. "If this type of coalition building can take place in a congressional race there will certainly be ramifications for city-wide politics."